Often times, families have a different setup - mom and dad are in different households and want to split tuition, grandma pays part of the tuition, or possibly an agency is responsible for a portion of a student's tuition. Jackrabbit allows for you to split billing between many parties to accomplish this. 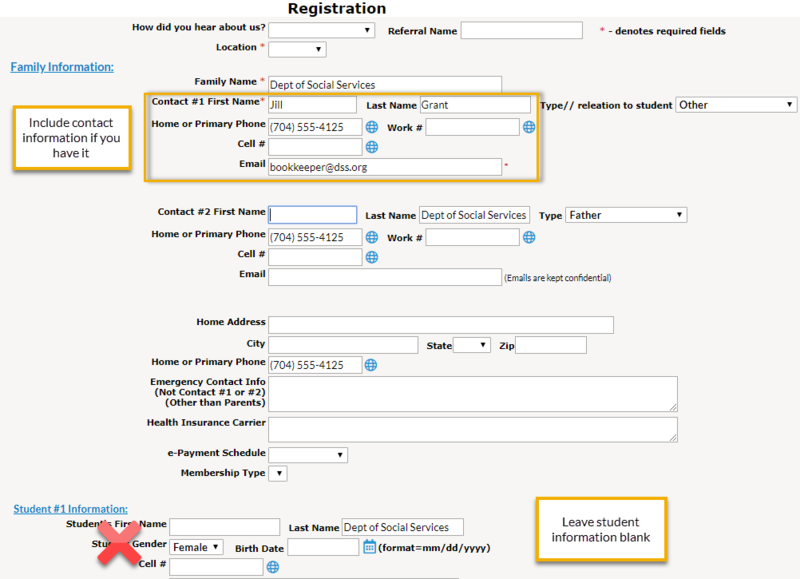 3rd Party Agency and Split Family Billing is only available when using Student Based Billing. Create a Family/Account with the last name of the agency. If you have a contact/account representative there, you can enter them as a Contact. No Students are entered in Agency Families. 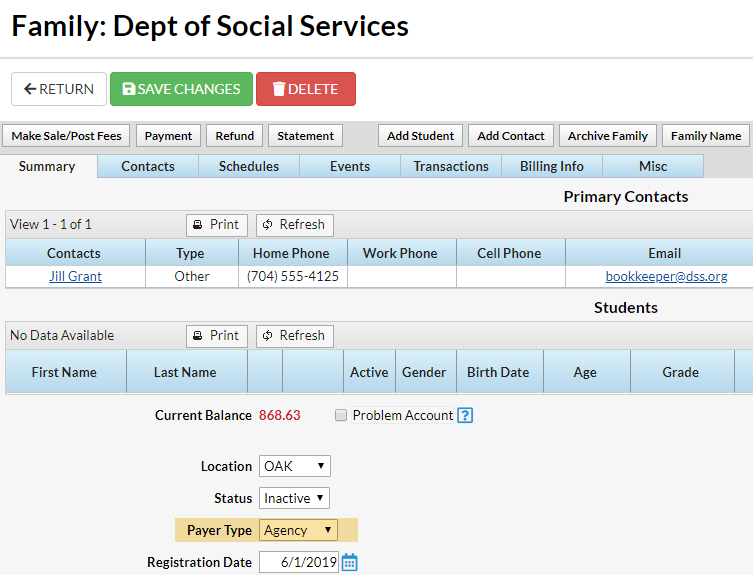 On the newly created Family's Summary tab change the Payer Type to Agency. Go to a Student whose bill is fully or partially paid by the Agency and click Assign Student Tuition button. Select the Agency from the Payer Name dropdown. If the Agency will only pay part of this tuition, use the Allocation% field to designate how much of it they WILL pay. Assign the rate one or more times with additional Allocation%'s until you have allocated 100% of the rate. You are able to allocate less than 100% if you choose. When you run group billing using Transactions > Post Student Tuition Fees the agency will be billed their portion of the Student's fees. Create a separate Family for the additional Payer and make the responsible party the Billing Contact on this account. Point to Families and select Add Family. Enter just the parent's name and contact information. No student information is entered here. Change the Payer Type to 3rd Party. The family with the student listed is considered the Primary Family. Add Student Tuition rates once for each responsible payer. Go to the Primary Family and click on the Student. Click on the Assign Student Tuition button. Choose the allocation for the family member on the primary family (the default Payer). Assign another rate for the other family member (3rd party) and choose the remaining allocation. When Posting Tuition using Transactions > Post Student Tuition Fees. Primary Family will have a fee added to their Transactions tab for their assigned portion of the tuition. 3rd Party will have a fee added to their Transactions tab for their assigned portion of the Tuition. When the Primary Family logs into their portal they will see only their portion and can view / pay only their portion. They will also see Student and Class information since the Student 'lives' in their account. When the 3rd Party logs into their portal they will see only their portion and can view / pay only their portion. They will not see any Student or Class information since the child is entered in the Primary's account.